Back of the Head: Smallville 8x17 - "Hex"
SUPERMAN! CHLOE SULLIVAN! LOIS LANE! (Two of her this week) JIMMY OLSEN! (sat this one out) TESS MERCER! (ditto) DOOMSDAY! (doomsditto) THE GREEN ARROW! THE JUSTICE LEAGUE: AQUAMAN! BLACK CANARY! CYBORG! IMPULSE! 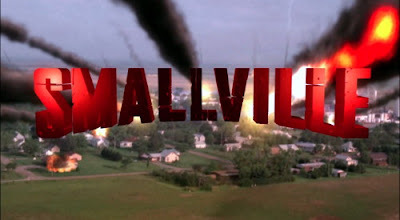 As evidenced, this was a gigantic DCU geekout episode, the biggest since the Legion of Super Heroes visited Smallville. Zatanna wanted Green Arrow to steal a magic book the late Lex Luthor had acquired which would give her the means to speak spells backwards and raise her father from the dead, at the cost of her own life. There's some fun interaction between Green Arrow and Zatanna. I liked how easily she figured out Oliver was the Green Arrow (because it really is bloody obvious) and how Oliver was pissed at her for chaining him up and left him in an alley in costume but without his hoodie and shades. I also liked Zatanna volunteering her services to Oliver in the future if he ever required her special skills. The A story, though, involved Chloe feeling blue because her marriage to Jimmy Olsen is kaput and Lois is living the high life Chloe gave up as the hotshot Daily Planet reporter. Zatanna was at her birthday party and offered her a wish, which turned out to be Chloe wishing for Lois's life, which actually turned out to be Chloe inhabiting Lois's body while the real Lois was on assignment in Mexico. "Krypton! Fortress! Jor-El! Doomsday! Chloe!" Zatanna gave Clark a wish where he didn't remember he has fabulous Krypton powers and thought he was an average joe. That didn't last long as Chloe reverted back to her hot little blonde self by encouraging Clark to resume his Supermanity. The mechanics of how the magic spells wore off were a little fuzzy, but who cares, this show has never been about the details. Some really great Chloe and Clark moments and Lois and Clark moments that shifted the series back to where we were before Lana shanghaied the show for four episodes. Plus all that DC Universe stuff as Chloe goes to work for Oliver and becomes Oracle (not by name) to the Justice League.